This morning, I went to Arashiyama to see how KOUYOU (autumn tints) is going in there. 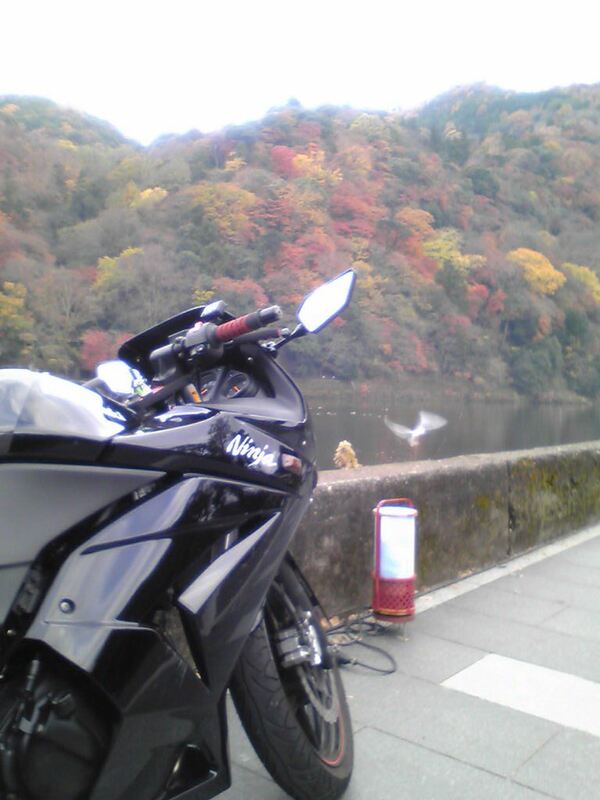 People say this season's leaves are not as good as usual season. 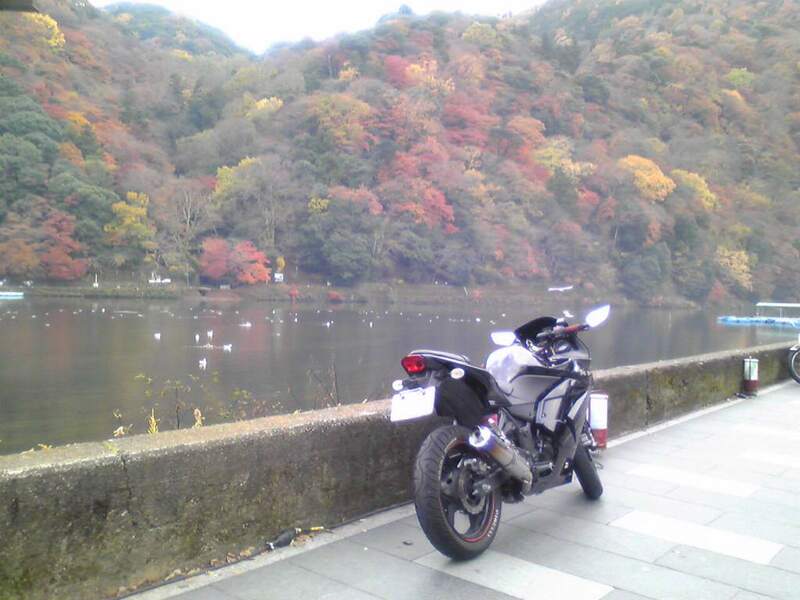 I would say the colour of leaves in Arashiyama is not as deep as I would expect in Kouyou season, but still it is very nice to ride through the falling leaves. I took the pictures at the point below. It was about 8am in the morning but many tourists are already taking pictures everywhere in Arashiyama area. 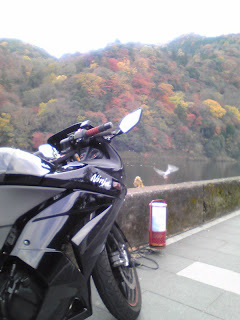 Kyoto is having nice Autumn weather now. Its little chilly in the night and early morning but when sunny its nice to go around the town. We received update from the Gion Corner, the traditional theatre where holds show to introduce Kyoto's traditional performance arts for international tourists. They hold shows everyday, but from December to February next year they will decrease the number of shows. When you are planning to visit Gion Corner, please check the dates they are open. Leaves changed colour to its Autumn colours lighted up at night is a wonderful sight. The list below are popular temples for their light-ups. All of these temples are easy to access from our Ryokan. 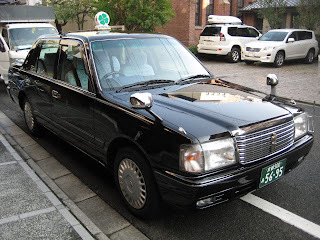 One taxi campany in Kyoto called Yasaka Group taxi has very interesing taxis. 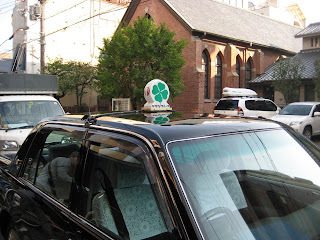 Their normal taxi which has Three-leafed Clover lamp on top of its roof, but instead of that few taxis have Four-leafed Clover lamp. It said there are 4 taxis in 1400 taxis they have but some say there are about 6~8. We had one of this taxi for picking up one of our guests The one stopped at our Ryokan. The driver of taxi told me that there are few small class taxis with Four leafed lamp, but like his one the middle class taxi is only one the campany has. 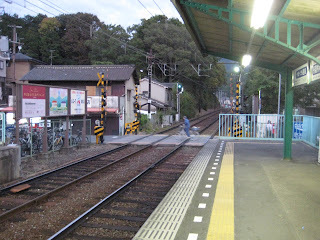 After getting off from the Eizan train, we followed the guided route to get to main street. 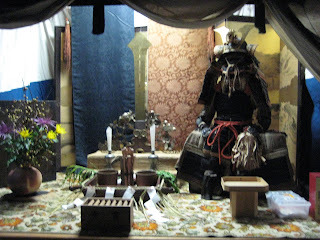 Near the bottom end of street there is place called Otabisho, where Omikoshi(portable shrine) rests at the end of festival. We arrived before the festival starts, so they were showing movie of previous festival at Otabisho. We decided to walk up the street. There were already fires beside the houses and some house were displaying traditional items inherit from theri uncestor like this. And then we got to massive crowd. 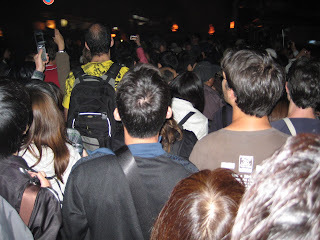 This is near Yuki Shrine where the torches gather at the climax of festival. Many people try to stay here to keep there good position to see the festival even tho polce annoucing everyone to move there were huge congestion. After few minute we got out of the crowed also the festival started. Firstly chidrens carry smaller torches and march down the street. In front of their shop there are large Torch. People in front of shop told us that it might take while the torches get lit and carried so we decided to have something to eat and tourist there told me there are food at Kurama Onsen. When we came back they were about to carry the torch. 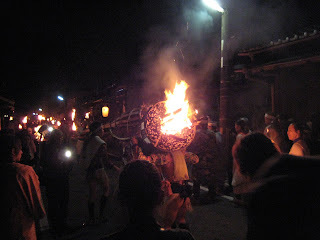 Then the torches got lit and they started to walk down to the Yuki shrine. 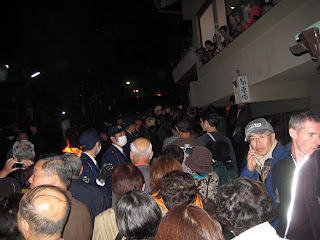 There were many torches carryed by men calling out chaunts all over the street and it was making the atomosphere of the suburb very energetic. We followed the parade down to the Yuki shrine. At the stone stairs, torches starts to gather. They put the torches upright and keep it until they can not hold due to the flame gets too colose to them. They let go torches to the end of steps and the timing they do that is incredible. Until the last torche go down, they keep stay at the steps and saying chaunts. 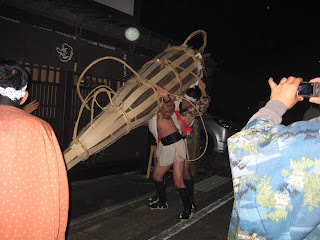 Then they carry Omikoshi (Portable Shrine) and parade the street again. After all torches gone, some people starts to get back. It is because we have to take same crowded train back. We both had things to do in next morning so we decided to go too. There were already ques and we had to wait about 1hr to get to the train. It was very uniique experience and worth the wait and getting through the crowd. I reccomend everyone to go to the festival if you are in Kyoto on 22nd of October. 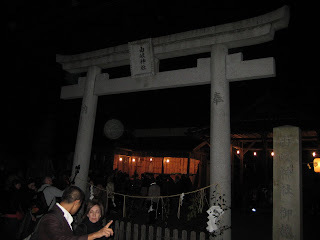 On 22nd of October, there was another popular festival in Kyoto held in Kurama, the northern small surburb of Kyoto. 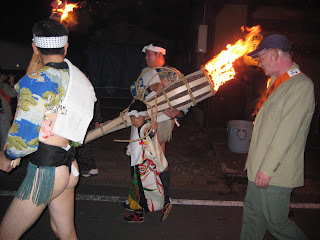 The festival is very unique, because locals parade down the street of suburb with huge torches.Its original purpose was to illuminate the path thorough the world of the living for the spirits of the departed. The festival begins at 6pm and continues to till past midnight. 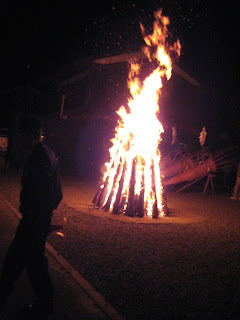 Fires are lighted in front of homes in Kurama for the opening of ceremonies. Childrens carrying small lighted torches marches down the street first, and after that teams of men chanting and marching to the rhythms of drums carry huge torches, the biggest one weighs over100 kilograms. 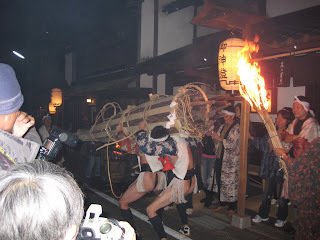 The torch carriers finally gather in front of Yuki-jinja Shrine and a portable shrine, or mikoshi, is carried through the smoky streets until the festival ends. I went to this festival with my friend and I would like to report this in 2 separate chapters. The road which has access to Kurama very narrow, so in the tourist season there are heavy traffic jam occures.There is bus route by Kyoto bus but it only runs 4 times a day.Currently it is the best to take Eizan Dentetsu Kurama line to get to Kurama.In tourist season people try to avoid traffic jam by taking train, but the maximum number of carriege is two,so the train gets almost as bad as fully packed train in rush hour Tokyo. When this festival held, roads get closed after 3pm and only locals has the access.So the only access to the area is by Eizan train, therefore the train gets packed. Really packed. 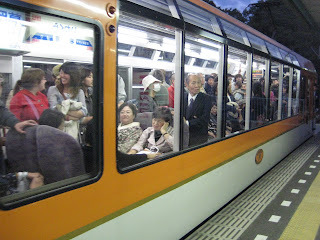 Kurama line starts from Demachiyanagi station, however it is best not to take the train from here.They will limit the number of people get on the train but not from other station inbetween Demachiyamagi and Kurama.If you prefer to sit down in the train, the only way is wait in the que. 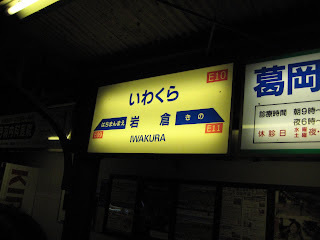 There were few people thought same things as we did and about 10~15 people got on the train between Iwakura to Kurama. I do not use train in rush hour usually and even I did Kyoto's train doesn't get packed as this, so this was theworst crowded train I took. 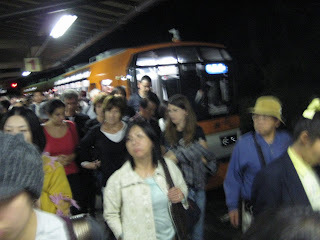 After getting off at the station there were already policeofficers guiding tourists to take route setted up.